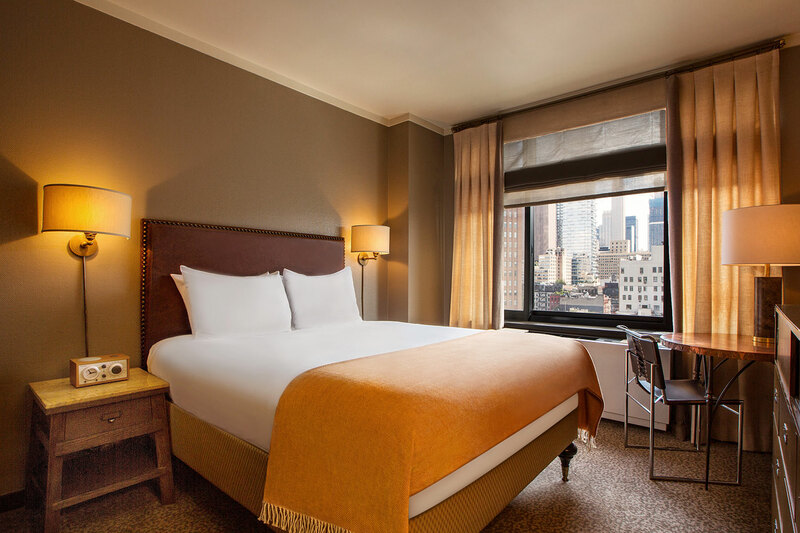 The 225 square foot Soho Queen Room, located on floors 4-15, features a custom queen pillow-top Englander mattress, down comforter and pillows, smart Samsung TV, and local gourmet minibar. A dream room for the design-minded, outfitted with a corseted leather Eileen Gray desk chair, marble lamp atop the custom round copper penny desk and marble top bedside tables. The walnut dresser and minibar cabinet are inspired by old travel trunks and the bathroom features white subway tile, a tub and New Yorker cartoonist Saul Steinberg-designed aviary wallpaper.